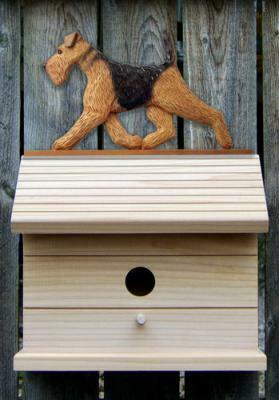 Airedale Terrier Bird House - Dog Lovers - combine your love for dogs and birds together with our Airedale Terrier Dog in Gait Bird Houses. Bird Houses are made of Western Red Cedar bird house with mounted hand painted dog on peak. Our Bird House measures 11 1/2" x 7" X 10". Hand painted dog measures 11 1/2" in length. Bird house can be mounted on a fence, side of a building, tree. The wood on these bird houses will turn a beautiful shade of grey as it weathers. Made in USA.